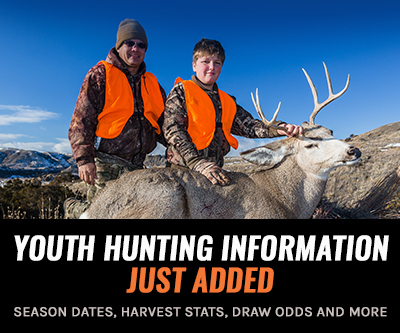 It is now officially mid-summer, tag results are out all across the West, and hunters are deep into their preparations for this fall’s hunts. This is always an exciting time of the year as we spend hours pouring over maps and gear lists to ensure that every little detail and need is met. One aspect of the hunt that has begun to wiggle its way into more and more hunters’ plans is developing a safe and effective way to hunt in grizzly bear habitat. In 1975, under the Endangered Species Act (ESA), the grizzly bear was officially listed as “threatened” by the US Fish and Wildlife Service. While this did halt the hunting of grizzlies, a specific recovery plan was not enacted until 1993. Since the development of the plan, the bear populations and their historic range have grown immensely. One of the more prominent populations found in the Greater Yellowstone Ecosystem (GYE) has grown from 136 animals in 1975 to an estimated 700 to 1,000 animals as reported by the Interagency Grizzly Bear Study Team in 2017. The second population of around 1,000 bears is found in northwest Montana within the Northern Continental Divide Ecosystem. While these recovery zones are large and very specific to size and location, it is important to remember that grizzly bears have begun to move into historic ranges and now occupy areas far outside of these recovery zones in parts of southwest Montana, northern and western Wyoming, southeastern and northern Idaho, and northeast Washington. 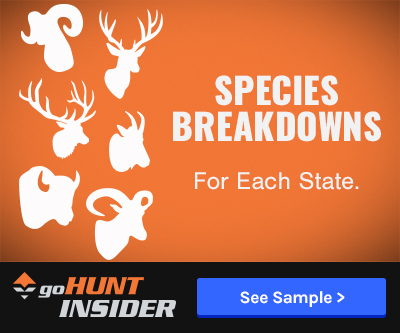 In 2017, the “threatened” status of bears found in the GYE was lifted and Idaho, Montana, and Wyoming drafted potential hunting regulations for the 2018 season. In early February 2018, Montana announced that it would not have a season for 2018 while both Idaho and Wyoming have moved forward with their management plans and even began an application period for hopeful hunters. While this is definitely a step in the right direction, the very limited tag numbers will mean that most hunters in grizzly country will still need to take defensive measures to reduce or eliminate close quarter grizzly encounters. 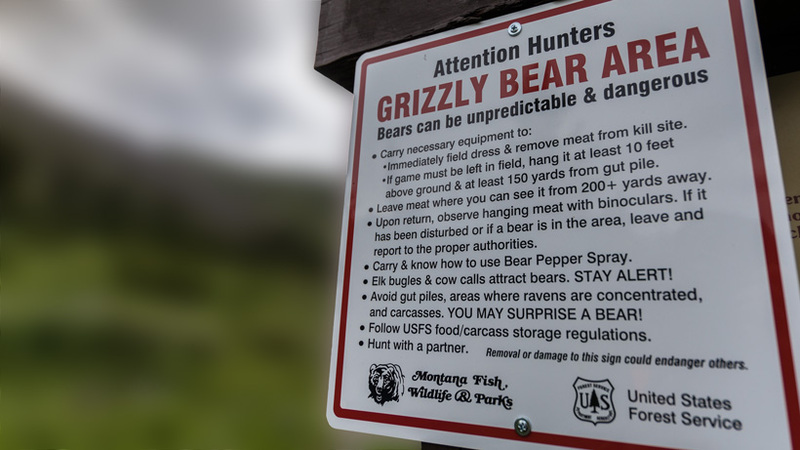 In the following series of articles, we will break down three commonly discussed parameters of hunting and camping in grizzly country: choosing and maintaining your campsite, precautions after harvesting an animal, and the wildly debatable topic of sidearms versus bear spray. While camping in grizzly country can be nerve-racking and concerning it can be done safely with good preparation and a solid plan of attack when you arrive at your chosen location. While there are many layers to this topic the two most primary areas of concern will be found in the camp selection and food storage. When it comes to bear encounters being sound asleep in a mummy bag and zipped inside your new lightweight tent is not an ideal situation. Carefully selecting your campsite can drastically reduce the chance of a grizzly stumbling through camp and deciding you smell like their next meal. Like you and I, grizzlies and other animals will often traverse their habitat by choosing the path of least resistance. 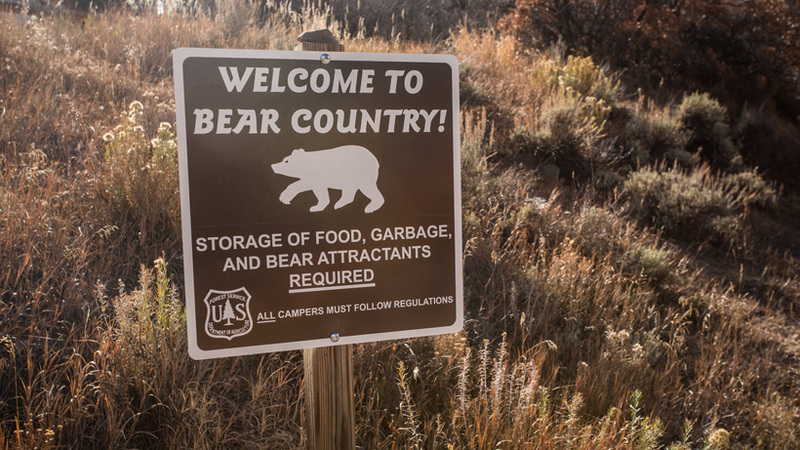 Big prominent ridgelines or trails are attractive camp locations as they provide quick access to your hunting area in the morning, but are also areas where bears will do most of their cross-country travel. Distancing yourself from these areas and allowing for an extra 10 to 15 minutes of hiking time in the morning and night will greatly reduce the chance of accidental encounters. Additionally, it’s always good to consider the most important factors of a bear’s day-to-day activities: food and water. 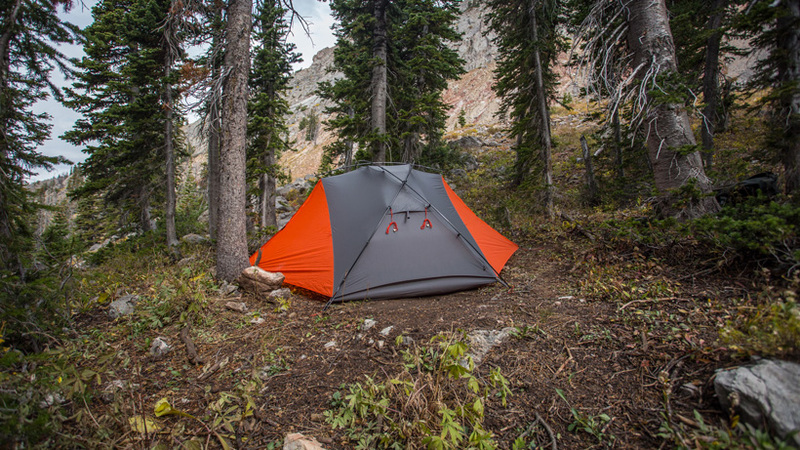 Camping near water has its obvious advantages and it’s always hard to turn away from a campsite in a picturesque meadow in your favorite elk basin, but these are also areas where bear activity can become centralized. Another consideration when selecting your camp location will be prevailing winds and thermals. While we try to keep all food and cooking activities away from camp, the simple fact is that a bear’s nose can still detect the smell of the steak you ate last week. Try to avoid locations where a predominant wind or thermal change could drift your wind into likely bear areas or down an entire drainage. While it will be impossible to entirely eliminate your footprint, simple precautions like this can drastically reduce it. For areas where a perfect campsite cannot be located, or for added protection, many hunters may choose to use other nontraditional means of bear deterrents such as electric fences, piles of brush or slash and simple bells and twine. The Bear Shock electric fence system from UDAP is one of the more popular options for camp security. 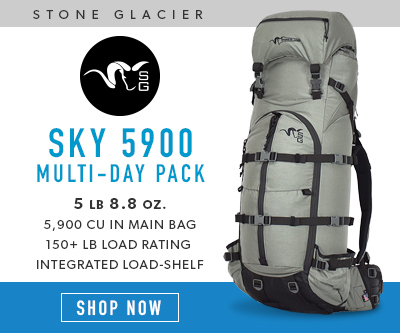 Weighing in at 9 lbs, this unit will definitely add some weight to your pack but has proven to be very effective. Running on four AA & four D cell batteries the Bear Shock can run continuously for up to three weeks on the highest output. For those not willing to sacrifice the weight or the cost, another method that has worked for some has been to build a brush or slash barrier around camp, which is a method commonly used in Africa to protect against predators. 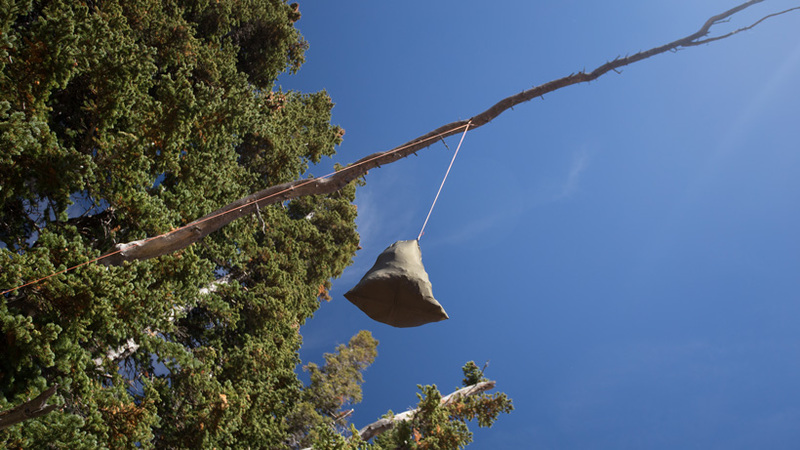 A simpler alarm system involves stringing cordage of some sort around the perimeter of the camp and attaching small bells over periodic distances. While this may not totally deter a bear, it will alert you to the presence of anything potentially heading your way. 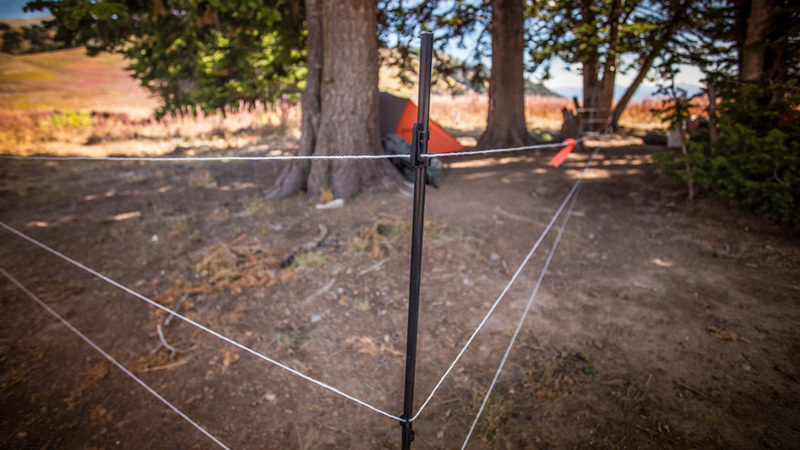 Grizzly bear backcountry electric fence around a tent set up. For instances where you are camping from a truck or base camp, you will find a little less freedom in choosing your camping locations, primarily due to being limited on where a vehicle can access, but precautions should still be taken. Warnings will often be posted at campgrounds where recent grizzly bear activity has been reported. Additionally, a few phone calls to local biologists or game wardens can also allude to historical bear use around certain areas. Grizzlies live and die by three main senses: their eyesight, which is good but not excellent; their hearing, which is good; and their noses, which are downright unbelievable. It is a commonly accepted fact that bears have one of—if not the most—advanced nose in the animal kingdom. In fact, a bear’s sense of smell is one hundred times greater than a human’s and seven times that of a bloodhound! If you take a grizzly’s sense of smell into consideration, it’s no surprise that food management around camp is going to be one of the most important factors when it comes to preventing surprise encounters. Before establishing a good game plan for food management it will be important to consider the type of hunting you will be doing. The equipment and procedures needed for backcountry hunting and truck or base camping will vary. Sometimes finding a suitable tree for hanging food is difficult. Out of all of the topics that come up when hunters discuss the backcountry, pack weight is probably one of the most common. Immediately, this is going to rule out cumbersome bear-proof containers and force hunters to get creative. The most common option is going to be filling a dry sack with all of your food, trash and cooking gear and hanging it from a tree. It is generally accepted that the food bag should be at least 12’ to 15’ from the ground, considering how tall a bear is, and 4’ from the trunk. This may seem like a troublesome chore but should be listed as rule number one in the “how not to get eaten in the backcountry” handbook. Selecting the right tree to hang your food from can take some planning in order to maximize the ease and safety for your approach. Much like selecting your camp, a good food location should be away from areas where a prevailing wind or thermal can drag the smell through drainages or likely bear areas. Avoid larger flats where winds often swirl or the bottoms of drainages where the smell is sure to travel long distances. The storage tree should be at least 100 yards away from camp, but more is preferable. As an added bonus, look for areas that can be glassed from camp or a nearby high point. Once a good location point is established it will be important that your food never leaves this area—with the exception of daily use items—and, particularly, never goes back to camp. Cooking should also be done in a location away from the camp as this will only enhance the food smells. Unfortunately, this means that your morning coffee, breakfast, and dinner will likely be candlelit and far away from the comfort of your sleeping bag. On this point, personal needs should also be done away from camp as digested food can still smell like food to a bear. In some wilderness areas across the western US, it may be required that even backpackers use hard-sided bear-proof containers. Fortunately, a few manufacturers have recognized the need for lightweight bear storage options and there are several options available. In the below list are a few of the more popular lightweight options. When basecamping from a vehicle or if using pack animals, weight virtually becomes a non-issue and more secure options will become readily available. 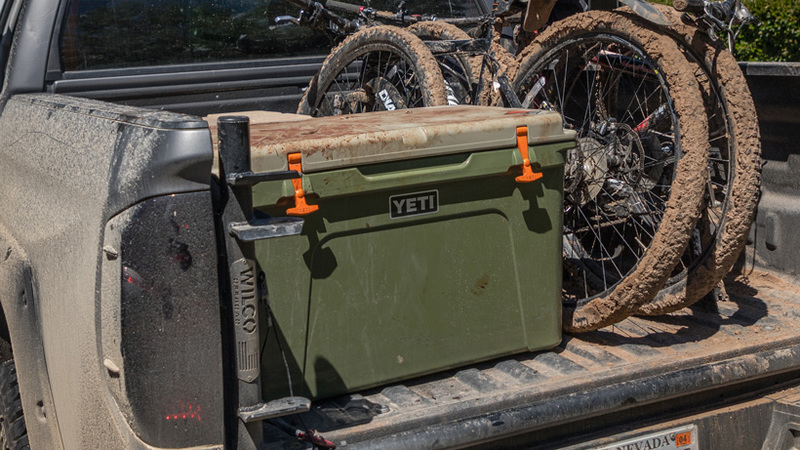 There are several lockers that are specifically built for heavy-duty food storage as well as some cooler manufacturers like YETI that can double as cold food storage to boot. A complete list of all of the bear proof containers for both backpacking and base camping can be found on this list from the Interagency Grizzly Bear Committee. YETI coolers are certified bear proof. Special care should still be taken with bear proof containers as these will still not be totally scent free. 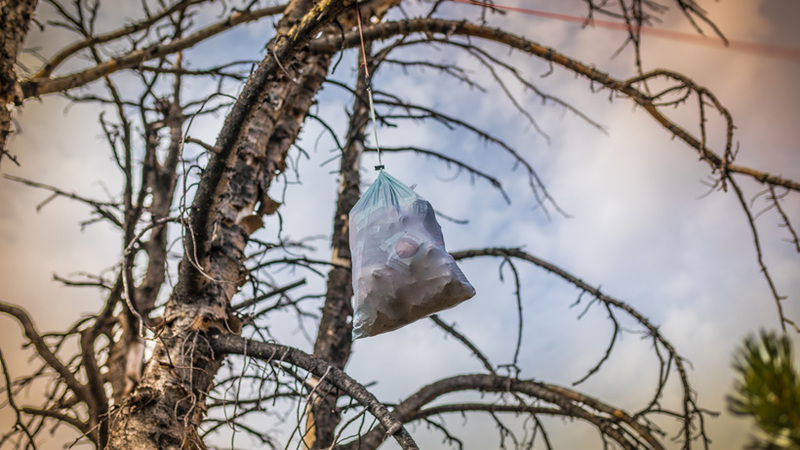 Keeping containers secured in trailers, campers or vehicles can be a great idea as well as hanging them in a tree much like we would when backpack hunting. Again, keeping the storage box in an area that can be observed from a secure location is never a bad idea and can prevent surprise encounters. With all of the information online available for safely sharing the land with grizzly bears, the best plan is going to be simply slowing down and using your head. Before heading out on your adventure, spend some time on Google Earth or topo maps and try to make a few plans for possible camps and food storage areas. Everything looks different when it's time for boots on the ground and plan A will not always be the best option. Practice stringing your food up in a tree or setting up your electric fence. Finding out your initial plan is not going to work on the first day of your hunt is obviously not ideal. In part two of this series we will cover what precautions need to be taken after harvesting an animal and how to safely get your meat—and yourself—out of the woods and back home. You can check out Part 2 of the hunting in grizzly bear country article here.